For weeks I have been trying to throw out this very used and very leaky garden hose and the City garbage men refuse to take it! It’s annoying (the garbage men) but then I thought they must be sending me some type of message urging me to repurpose and reinvent this green coiled mess. Yea right. .75″ x .94″ corks (to seal the cut ends of the hose lengths). Using the garden pruners, cut a section of the hose so that it creates the outer half circle of the mat. 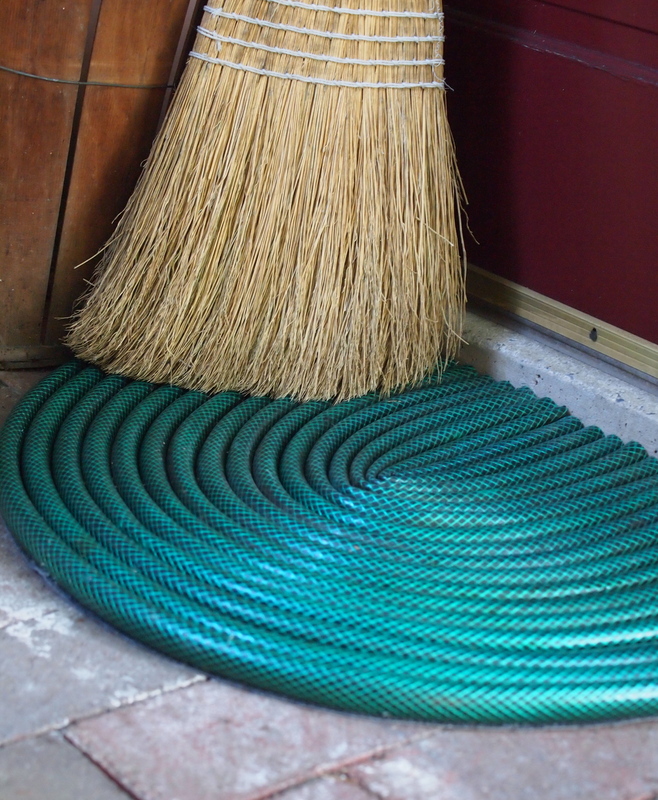 Don’t worry if the ends of the hose hang over the mat…you can trim them off when you’ve finished gluing all of the sections onto the mat. Place a generous amount of glue on the hose then position it on the mat. Remember, you’re working with the outer half circle first. Finally, with a scissors cut the door mat base to the half-circle shape you’ve created. I feel really great about this project because I’m keeping crap out of the local landfills and this mat is super durable and easily cleaned by hosing it off….ironic isn’t it. Thank you garbage dudes!